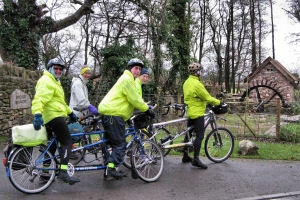 This event was based at Cheddar Youth Hostel. 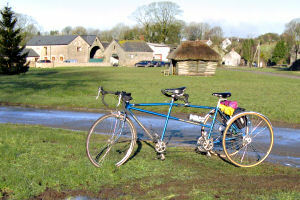 The whole hostel was booked for the Tandem Club, which included the main building and the annex which is right next door. Hostel meals were available (including vegetarian) and each building had its own self-catering kitchen. There was a special meal on New Year's Eve. 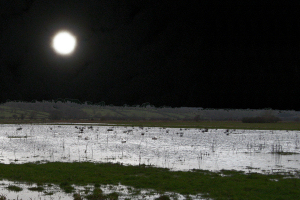 There had been a lot of rain (and snow) leading up to this event. 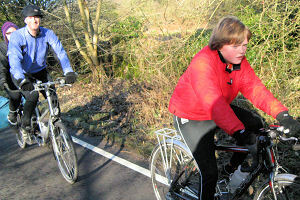 Rides were organized for three days on Wednesday and Thursday, 30th and 31st December and Friday, 1st January. All three days were very cold and it rained a little on Wednesday but the other two days were dry. Today's route went northwards via Axbridge, Winscombe and Sandford to Congresbury but we didn't see much of the towns as we travelled along the Strawberry Line Rail Trail. 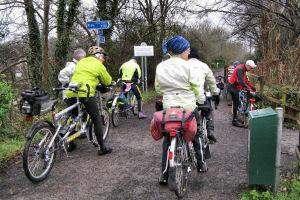 Although it was very cold and damp, it was a very pleasant ride marred somewhat by the number of gates through which tandems had to be pushed or lifted. Eventually we went back outdoors to the damp and cold to return to base, travelling mostly southwards via Iwood, Brinsea, Churchill Green, Sandford and Winscombe, where we stopped for buns at the excellent Birds cake shop. 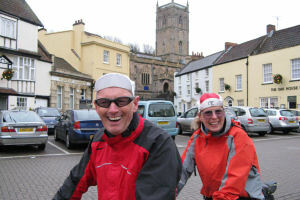 The final leg took us back through Axbridge, beside the Cheddar Reservoir and home to the warmth of the Hostel, where we enjoyed hot tea and the buns that we had bought at Winscombe. Today's ride went southwards towards the Levels but not before we had an unexpectedly hilly start along the edge of the Mendips. 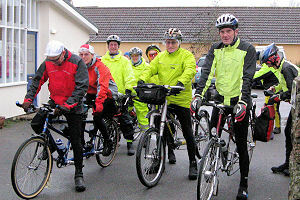 The weather was dry today but very cold, so the stiff start enabled us to build up a bit of body warmth. 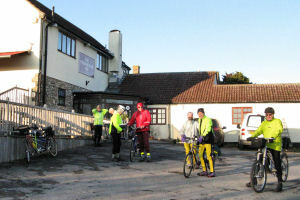 We cycled to Cocklake and then Wedmore, where most of us stopped for refreshments at The Pumpkin. From Wedmore we continued southwards rising to the giddy height of 60 meters at Sand before descending to a couple of meters after Heath House. Soon we had to make a decision as to whether we would do the long route or the short route. The long route continued southwards to Shapwick before turning to the west as far as Cossington before turning to the north towards Mark. The short route headed directly to Mark without the southern loop. Most people stopped in Mark at the White Horse for lunch. There was an open fire in the grate, which never really got going... but the food was very good. 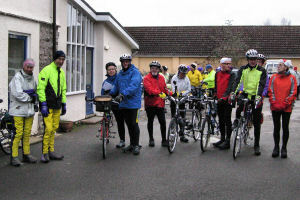 Travelling northwards, it was very cold across the Levels after lunch until we reached the relative warmth of the Mendips at Loxton. 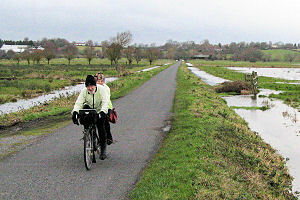 We then travelled eastwards back to base on an undulating route via Compton Bishop and Axbridge. In the evening, we enjoyed a special New Year's dinner followed by a Quiz. It was sunny today but still very cold and frosty at the start. We delayed the start in the hope that the frost would clear. 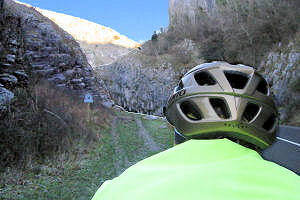 The first 5 miles warmed us up very well as we ascended through the Cheddar Gorge with sun shining on the top of the hills, way above us. 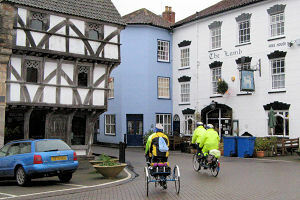 After 6½ miles, from the start, we had a welcome coffee stop at the The New Inn in Priddy. 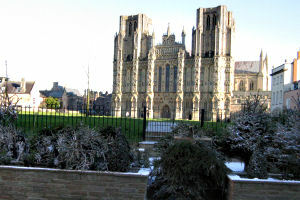 After coffee, we descended to Wells, taking care over the icy patches. Wells was very quiet and we continued on our way across the Levels towards Godney, where we had expected to stop for lunch at the Sheppey Inn. The Sheppey Inn was closed until March... so we continued on our way to Panborough where we had an excellent lunch at the Panborough Inn. 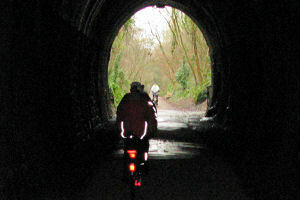 The final section took us northwards through Wedmore and Hythe and so back to base for the final time. Many thanks to David and Linda for an extremely well organized event and all the work involved in putting it on.